Sonic Youth have always tried to push themselves and subvert expectations with their experimental alternative and noise rock. Led by Thurston Moore and Kim Gordon, the band infused DIY spirit with avant-garde embellishments and a progressive New York state of mind. By 1991, they had just released two of their most celebrated records, 1988’s Daydream Nation and 1990’s Goo, and they were gearing up to release another career-defining LP, 1992’s Dirty. 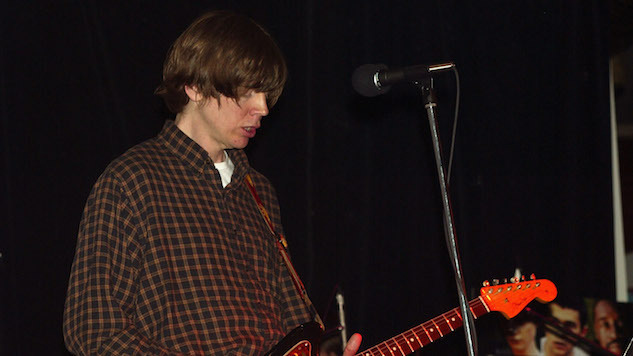 On this day in 1991, Sonic Youth performed at Neil Young’s annual Bridge School Benefit in the Bay Area, which featured big names to perform acoustic sets to raise money for Young’s various charities. Sonic Youth seemed like an odd choice for an acoustic set, given their distinct sound was so crucially indebted to distortion pedals. In fact, the band had never performed acoustically before. Featuring the band’s classic four-piece lineup, the band trudged on for a performance marred by technical issues that apparently left much to be desired. However, two songs, “Dirty Boots” and “Mote” were both delivered without any mishaps. Though Moore voices “Dirty Boots” quite nicely and Ranaldo does his bit to his intense “Mote,” no other songs from this set are able to get off the ground. Struggling with tuning issues and further problems with the onstage mix, the frustration forces the f-word from Gordon—twice—who flings her instrument aside in disgust. Here we present those two songs that the band was able to make it through without incident. Though not at all indicative of the thrilling electric powers of live Sonic Youth, it is an historical document chronicling an experimental band once again pushing their amazing talent in a new direction.